Jim Carrey is regularly written off as a goofy fool who is only suitable in low brow comedies. It is movies like Man on the Moon and The Truman Show that remind audiences that Carrey is incredibly talented when he wants to be and more than just a rubber faced comedian. 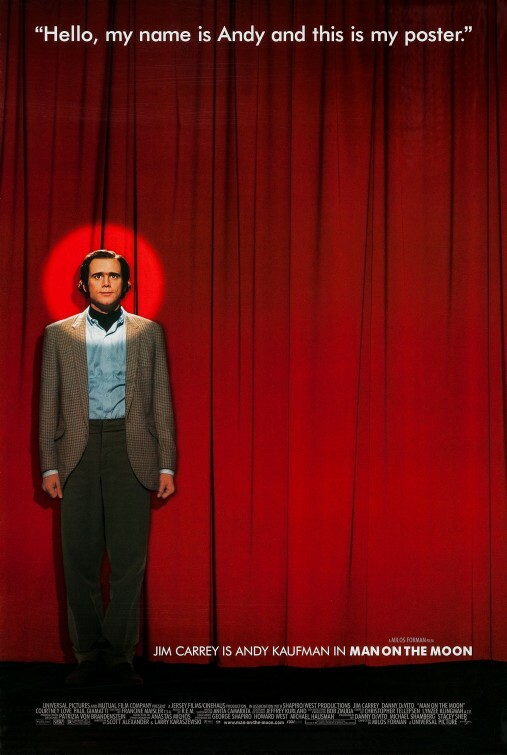 Of course those talents help Carrey considerably in Man on the Moon, as he is playing out-there comedian Andy Kaufman. Man on the Moon shows the rise of Andy Kaufman from obscure stand up performer to the star of the 80s sitcom Taxi. Along the way, Andy’s outlandish activities frustrate the network airing Taxi and put him offside with many of the executives running television. As the network tries to prevent Andy’s outrageous antics, it only encourages him to do them more. Outside of his wacky foreign character on Taxi, Andy also used rude nightclub singer Tony Clifton as an alter ego to insult anyone he could, and also begun infuriating the female population by daring them to wrestle him. It seemed the only people who found these antics funny were Andy himself and his partner, Bob Zmuda (Paul Giamatti). And that was all Andy cared about. The film also shows Andy getting sick and dying, but hints at the rumour that he faked his death may have been accurate. After some research, I found out that his death certificate is available to the public if anyone wants to see it. I enjoyed this film a lot. I really think that comedians are unfairly lambasted by the arty types who only like dramas and foreign language comedies. I think that it is much easier for a comedic actor to make a drama than it is for a dramatic actor to do a comedy, and do it well. There are several examples of great comedians that have been able to make the transition to dramatic roles. Carrey, Tom Hanks, and Will Ferrell are great examples of actors who made their name in comedy, but have successfully made a dramatic role. Steve Carell is another example being known for comedies, but can also pull out a Little Miss Sunshine or Foxcatcher should the need arise. The list of dramatic actors making a similar switch to comedy is much lower. I really can’t imagine Leonardo DiCaprio doing a comedy and making it work. I am not going to say he can’t do it, but I would be surprised if he could be as good in a comedic role as he is in something like The Departed. Jim Carrey does a terrific job playing Kaufman. I have read that he basically transformed into Andy on set, only answering to that name when he was needed. He embodies the crazy comedian so well and the whole film works because of his performance. Carrey would end up winning a Golden Globe for this performance, something that was definitely deserved. Man on the Moon is a good film. It shows an audience that Jim Carrey can be far more than just a rubber faced idiot. This is one of maybe three Jim Carrey movies that I really love. His career may have been built on his rubber face and fart jokes, but he really shines when he takes things more seriously. This is an odd thing to say about a movie depicting the life of the decidedly non-serious Andy Kaufman, but Man on the Moon takes its subject matter very seriously. Man on the Moon was a moderate flop at the box office, but that had nothing to do with Carrey’s performance. Carrey is amazing, completely becoming Kaufman onscreen, warts and all. (Apparently he became the comedian offscreen as well. refusing to be called by his real name during filming.) This is probably part of the reason this movie didn’t make money. Kaufman was an incredibly polarizing performer, often turning the joke on the audience in the most uncomfortable way he could think of. It was very uncomfortable watching some of the scenes shown in this film, even though I was in on the joke. In that way Carrey perfectly embodies Kaufman’s work– it all feels real, despite being fiction. While Carrey’s performance is great (as is most of the cast), the story itself is a little thin. The movie often feels like a bunch of Kaufman’s more outrageous antics strung together with no real plot. In fact, by the end of the film I felt like I still didn’t know who the real Andy Kaufman was. Maybe this was the point. His professional life was built on blurring the line between performance and reality. However, better insight into Kaufman’s private life would have been interesting to see. I mean, why make a movie like this if you aren’t going to delve into your character’s real life? There is some substance, especially when the movie deals with Kaufman’s lung cancer diagnosis and death. These scenes are poignant, but by the end I still felt like the audience was on the outside looking in. It seems that only those who actually knew Kaufman are allowed to be in on the joke.